Fuel dumped before crash likely avoided, "massive fireball"
Officials have confirmed that a U.S. Navy F/A-18 Hornet jet has crashed in Virginia after taking off from U.S. Naval Air Station Oceana, with the two pilots believed to have ejected before impact. U.S. Navy Captain Mark Weisgerber has confirmed that the jet suffered a "catastrophic mechanical malfunction," shortly after takeoff but has not released specifics of what may have caused the crash. Weisgerber said that both pilots are reportedly conscious and "doing well." There are currently no reports of fatalities on the ground. Several photos have emerged from the crash, showing the wreckage and black smoke rising from nearby buildings. Virginia Beach Mayor Will Sessoms has said that rescue crews have completed a search of two of the five buildings impacted by the crash. Virginia Beach EMS division chief Bruce Nedelka said several witnesses saw the pilots dumping fuel from the jet before ejecting, which likely avoided a massive fireball and fire. "We are confirming that there is one aircraft from Oceana that has crashed into the apartment behind us. Both pilots were transported to a local hospital and both were conscious, that's all I'm going to report on that." "In the apartment complex we do not have any confirmation yet of injuries. We are still in the stages of extinguishing the fire and we have to do some extensive searches in those buildings." Riley said the department is working on an unified press release that will be issued to the public shortly. Virginia Department of Transportation traffic cameras showed black smoke rising from the Birdneck Road area of Virginia Beach at 12:30 p.m. local time, FoxNews reports. 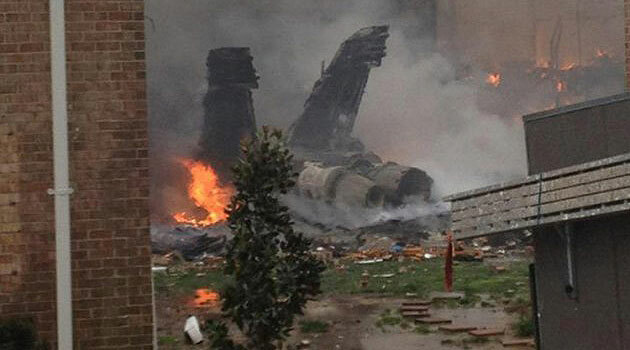 MSNBC is reporting that a local witness told the network the jet crashed into a local two-story apartment building. They are also reporting that two individuals have been admitted to nearby Sentara Virginia Beach Hospital in connection with the crash, according to a public information officer at the facility. One of the individuals is reportedly one of the two pilots who ejected from the plane, while another is a civilian who is suffering from smoke inhalation. "He was in shock and still strapped to his seat," Volunteer rescue squad member Pat Kavanaugh told CNN affiliate WTKR.